Across the windswept steppes of Syria, the golden, or Syrian, hamster (Mesocricetus auretus) lives underground, venturing out at night to gather grasses, seeds, grubs and small insects. In his natural habitat, Kirby would gather as much food as possible, stuffing it into his cheek pouches and carrying it back to his hidden nest in the ground. In your home, it's important to feed Kirby nutritionally complete foods, saving his favorite foods as special treats. In the wild, a large part of a hamster's diet is made up of seeds and grains. Even in his cage, safe from predators, Kirby stuffs his favorite foods, including corn, sunflower seeds and peanuts, into his large cheek pouches. He hoards the food, gathering it at night and moving it from his dish, hiding it in corners and under his bedding. During the day, he wakes at regular intervals to enjoy his daytime snacks. While small amounts of vegetables such as broccoli, carrots, cauliflower, celery, greens and peas, are welcome treats, they can also cause diarrhea in Kirby. Diarrhea, also known as wet tail, is a dangerous condition and can kill a hamster within a day due to his small size and dehydration. Limit vegetables to once or twice a week treats, giving Kirby small 1/4- to 1/2-inch-size slices. Pet stores and some online resources also recommend giving hamsters apples and bananas, however, Kirby's digestive system didn't evolve to process sugars; avoid feeding Kirby fruits. Hamsters are omnivores. In the wild, they enjoy insects and grubs as well as seeds, grains, grasses and vegetables. Tiny pieces of beef, 1/2 teaspoon canned dog food or a few mealworms provide a tasty protein treat for Kirby. Like vegetables, meat treats should be limited to once or twice a week treats. 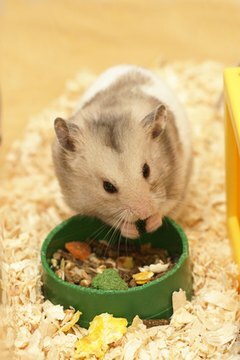 While hamsters enjoy a variety of seeds, grains and vegetables, the Veterinary Hospital at University of California, Davis, recommends feeding Kirby hamster or rodent pellets daily. Kirby may happily eat other items as treats, but the pellets are formulated to provide the proper amount of protein, carbohydrates and fats, ensuring that Kirby leads a long and healthy life. Small Animal Advice: What Do Hamsters Eat?